Today’s technology has opened up new risks and parents should keep an eye on their kids a well as on their online activities as Facebook bullying is on the rise. Over the last couple of years, social media has become an essential part of our lives. Some social networks are popular among a particular age group like teenagers. McAfee which is a well known security firm has done some research on this matter and according to the results, kids experience cyber bullying on Facebook. McAfee surveyed hundreds of kids and more than 92% of them say bullying takes place on Facebook. As Twitter is not so popular among teenager, only 23.8% of those kids blamed that. 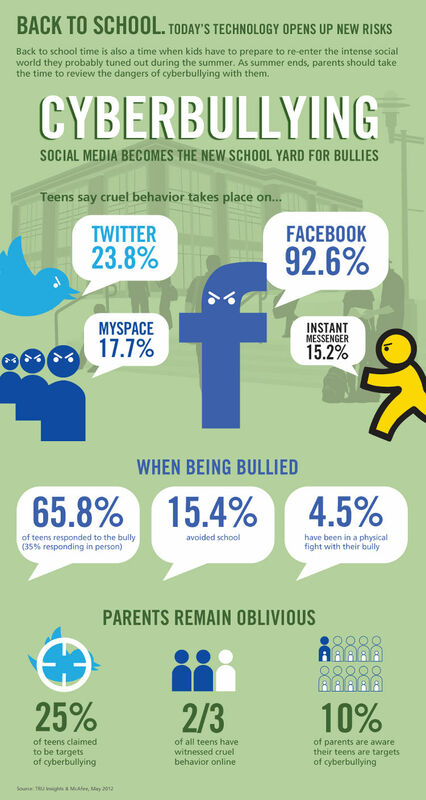 Additionally more than 17% of kids witnessed cyber bullying on MySpace and 15.2% of them faced it on IM. The survey revealed some other surprising facts too. More than 65% of those kids responded to the bully while almost 15% of the kids avoided school after facing cruel behavior from their peers. Almost 4.5% of the kids decided to take matter in their own hands and they responded to the bully in physical fight. Unfortunately only 10% of the parents realize the risks involved with online world and they are aware their kids are targets.